One or two species of Agama can be found in Europe. 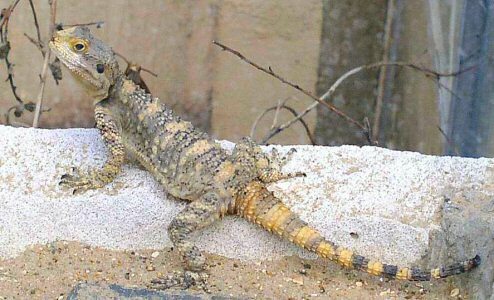 Of these, the best known is probably the Starred Agama, Laudakia stellio stellio. While these are a species that can be kept in a greenhouse they tend to be extremely nervous and as a result they can be difficult to even see at times! Conversely, for some reason, this subspecies (L.s. brachydactyla), which is much more colourful, is also far more sedate and most individuals become almost ridiculously tame quite quickly. It is quite common for animals to run up my trouser legs (on the outside I hasten to add!) in order to get food. They are among the few herps I know that will even sit happily on your hand eating locusts or mealworms. They originate from southern Israel, southern Jordan, northern Saudi Arabia, Sinai and Egypt and in some areas overlap with L. s. stellio. In terms of body shape this is an absolutely typical largely terrestrial agama. It is a stout lizard and the body is slightly flattened with a broad head. The scales are distinctly tubercular and the ears in particular display the protective spines typical of many desert dwelling lizards. The tail is covered in whorls of spiny scales. It can reach about 30cms in length of which the tail is about half. The body tends to be some shade of grey in colour and the back marked in diamond shaped blotches or lateral stripes or bands which range from a pale creamy yellow through to a rich orange. There are frequently similar coloured blotches on the flanks which sometimes join with the back markings to appear as complete bars. The tail is usually completely banded. In females the throat is generally a pale grey, but in males, particularly in the breeding season, it can become almost totally black. This is particularly noticeable when they display - best described as press-ups, raising and lowering the whole forepart of the body rather than the common agamid head-bobbing. I first came across these animals in the early 1990's although I was not successful in breeding them consistently until I changed the greenhouse glazing to UV transmitting. This species is sometimes regarded as an alternative to the Bearded Dragon. Certainly, a pair, or even a trio, can be kept in an indoor terrarium of sufficient size. These are very active lizards and such a group would need a vivarium of about 1.3m x 0.6m x 0.6m. Decor should be semi-desert and no plants are necessary. Firmly fixed rocks or similar artificial structures should be provided for basking and also to create caves in which the animals can hide. UV lighting is absolutely essential and can be provided by a suitable UV tube in such a vivarium. During the day the vivarium should have a temperature gradient from 20-25C at one end to about 35C at the other. A heat source at the hot end could provide up to about 40 C locally. One of the commercially available reptile sub-strates allowing burrowing would be suitable. Some individuals will drink from water bowls while others prefer a light spray on the rocks in the mornings to emulate dew. Although they come from even more arid climes than some L.s.s I have found that they do not share that sub-species' aversion to water and are amazingly unworried about being sprayed inadvertently. They will need a winter dormancy if you want them to breed, but this can be as little as 5-6 weeks with the temperature lowered to 10-15C throughout. An even better, simpler and cheaper way of keeping these animals is in a greenhouse. Certainly in the southern UK this requires no supplementary heating at all. They are extremely tough and handle the necessarily longer hibernation period from mid to late October to mid-March with absolutely no problems if they have a suitably insulated hibernaculum. This will also enable them to hide from extremes of heat. Although I have kept them with no difficulty in such a greenhouse with plain glass and vitamin supplements breeding was extremely poor. With the glass replaced with UV transmitting acrylic it became a regular event. Decor can be similar to that for an indoor vivarium but it is wise to ensure that an adequate cave for them to hide in is provided and preferably lined with expanded polystyrene. In such a relatively large area these animals can be kept happily in groups of up to as many as a dozen. Although males are territorial once a pecking order is established the sub-ordinate male will often not even come into breeding condition. This at least means that it is possible to keep a "reserve" male in case of problems. Mating takes place within a month or so of emerging from hibernation. The male(s) - or the dominant male will often be seen adopting a suitable vantage point from which he is clearly visible and perform a series of press-ups, often with his dark gular pouch inflated. This serves both as a territorial display to other males and as an initial mating display to females. If you have two or more males, initially more than one may do this, but after a bit of chasing and displaying to establish dominance it will normally be restricted to the dominant male. If a female is receptive to a male, he will quickly grasp her with his jaws by the back of the neck and coitus, generally of short duration will take place. Egg-laying will take place about a month later, although this period can vary tremendously in a greenhouse due to the variation in weather conditions. The female will choose a suitable spot and dig down as much as 25 cms to lay her eggs. The preferred medium varies from female to female. Some of mine use the provided sand area, others actually heave substantial cobble stones away from the underlying peat, dig their burrow, and then, after laying the eggs, roll the stones back. I failed to find eggs for two years until I saw this astonishing behaviour - and astonishing strength! A clutch is typically of 8-10 eggs. Even in the greenhouse, early clutches are sometimes followed by a further mating and a second clutch. Conversely, these same females will often only lay every second year. Using my incubation technique, the eggs tend to hatch after 50-70 days. This is a very large variation and I am unsure why this is the case. The young are perfect miniatures of the adults although seldom show the bright adult colouring at this age. Sometimes this can take as much as a year to become apparent. As with most lizards, they should be segregated from the adults for the first few months of their life. These are primarily insectivorous lizards and should be fed a suitable range of insects. When fully grown they can handle any of the invertebrates listed in our live foods page. These should be gut loaded and dusted with a suitable multivitamin powder. In addition most individuals will eat some plant matter - Curly kale and dandelion flowers and leaves seem to go down well. This particular sub-species is occasionally imported and becomes available in pet shops. I am reluctant to recommend these as they are wild caught and even though there is no evidence of this significantly impacting the populations I neither favour nor recommend this on conservation grounds. Additionally, while I will freely admit with this species the incidence of infection or parasitism seems to be low, and due to their ease of maintenance, they are usually in good condition, nonetheless these factors to present a real risk. A few people in the UK do breed this species and they will provide a more reliable source of good quality animals. Laudakia stellio stellio x brachydactyla. An interesting fertile hybrid between the two sub-species. Characteristics of both. Easier to tame than stellio and very hardy. Laudakia stellio picea. Very different in appearance. Black with orange markings, unusually the females often being the more colourful. Only grow to about half the size of the other sub-species. Also good vivarium animals but the least hardy and least damp tolerant of the group. Can again become very tame. The totally unrelated American Fence/Spiny Lizards (Sceloporus spp) are very similar in their overall requirements and behaviour. Sceloporus cyanogenys (Blue Spiny Lizard) is a particularly hardy species which can thrive in greenhouses in the extreme south of the UK. This is one of the largest Fence Lizards and extremely attractive. Unlike the Laudakia, it has the advantage of producing live young.